meh... nothing new... nice animations and camera work though. Nope, nothing new. But some people missed it, so I figured I'd link! well yes, anyone who did not get scarlet would not have seen that closing cenimatic, which this posted video basciully is. So on that premiss, good for those that did not do or complete season uno. I for one am looking forward to enforcing her majesty's peace in those uncivilized parts. The Zephyrites have met with trouble, and there are rumors of a disturbance in the tangled western reaches of Brisban Wildlands. Work together with your friends and Marjory, Kasmeer, Rox, Braham, and Taimi to discover what's going on! Log in on July 1 to experience the start of Living World Season 2 and unlock the story content permanently in your Journal! Like I said.. give me Dry Top, Balthazar's Shrine in the Jungle and the blood stone... and I am all set!!! I saw the new living story content and squealed like a little girl. Its bringing back soo many GW1 memories i cant wait. Oh god, I read 'enforcing her majesty's uncivilized parts'... Thanks dysl-exia! Kasmeer Meade "Between you and me, I think these Zephyrites are hiding something." Rox: "What is all this Asuran googly mook anyways? These symbols and things make me nervous." There speculations about White Mantle being involved. >.> Thoughts? same spot on the map eh? Must be some sort of Consortium Hideout or somthing. Since that is near Maguuma Stade, probably is. There was also rumors I heard about the White Mantle being involved. Which would not be surprising if we do head all the way north west to the Isles of Janthir. Janthir, not sure if human or Mursauut, but they are in that area. The Island inhabits "The ones with true sight". The ability to pierce into ones soul and body to tell who that really are. Also all mentions of "The Unseen Ones", are Mursauut as well. 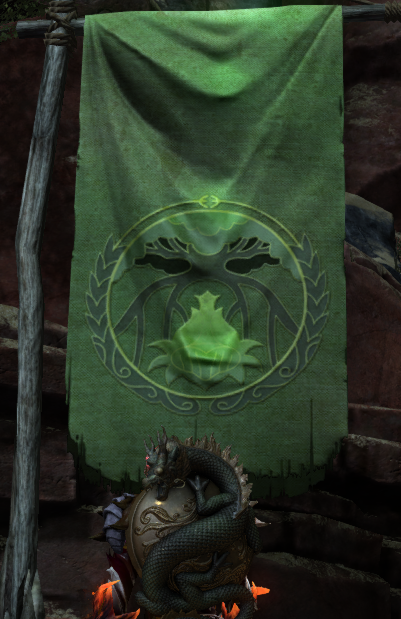 There was atleast one remaining one that I know of in spirit form in GW2. Not sure where in the world he is though. But that area of the world is their home. The religion is very deep with the White Mantle. And they are very loyal to them because the Mursauut, in the end, did grant them salvation from the Charr 268 years ago. A person is a good Believer to the extent that he earnestly places importance in his masters. But even a person who is good for nothing will be a reliable supplicant if only he has the utmost faith in his masters. I know ANET mentioned that the Mursauut will be in GW2 about year and a half before the game launched. My guess is, IF we do head north, that we will run into them. I highly doubt they have anything to do with Mordi besides being a possiable foe to him. Which means allies to us? Heck, we allied ourselves as players to Palawaw Joko, why not?!? Which I still cant wait for Elona!!!!! I know... I dont have warm and fuzzy fillings about there either considering their only means is to surpress the other races into extinction or slavery to their will by means of work and worship. But... their ability to help get rid of a Dragon can not be overlooked. 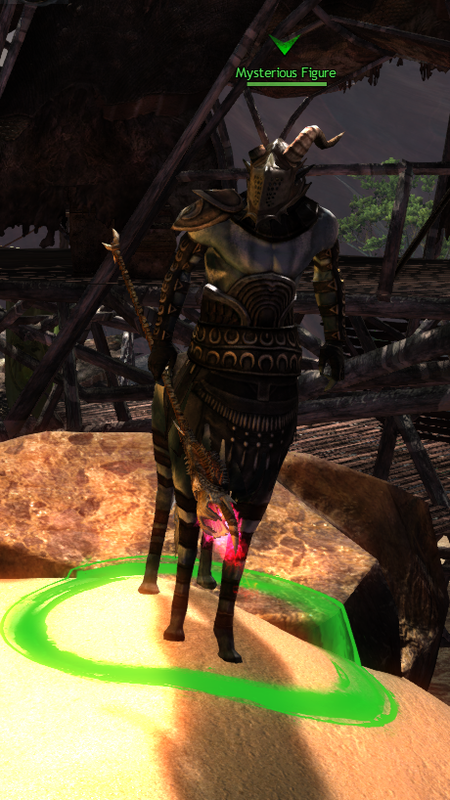 And I find the Mursaut to be less dangerous to ally with then Joko. It's less than an hour away!!! WOOHOO!!! After 1pm EST. AFTER. =P Some patches weren't released until 7pm (granted that was a huge patch change). personally I prefer the 7pm patching... that way you all dont get a head start on me! Aw come on Kit: you had to ruin my excitement. And it'll give me time to do my dailies and map completion so I won't complain if it's late or not. The following are Spoilers from S2E2. Apparently, The Festival of the Four Winds is being counted as E1. So first, I called it! The first area was in fact Dry Top. however, it is much much much different then the Dry Top of GW. Its completely different and some how inhabited with adobe like buildings built by all the main races. We found Scarlet's original hide out where she found a conduit of lay lines. One of which is in side the mine. Which we have yet to be able to really go into. There is nothing we can do now to shut down that lay line I believe. Unless its a means of how the dragons feed each other energy. Then we might have to find a way. One of the Scarlet studies showed the need for the connection between the Mind and Magic. And that a close bond between the two will yield unlimited ability. Possiably enough power to reval that of the original magic use BE. For those that don't know about the Bloodstones. At 1 BE (Before the Exodus of the Human Gods) Abbaddon gifted the great ability of magic upon the races of the world, without the permission of the other gods. King Doric, the King of Arah and leader of the human race, begged the Gods to remove the magic and rid them of the power struggles and war that was going on. The Gods granted King Doric wish, but it cost him his life. The Gods took most of the powers away and place it into a large stone which was sealed with the Blood of King Doric. This stone was thrown into the Volcano in the Fire Islands which erupted soon after. 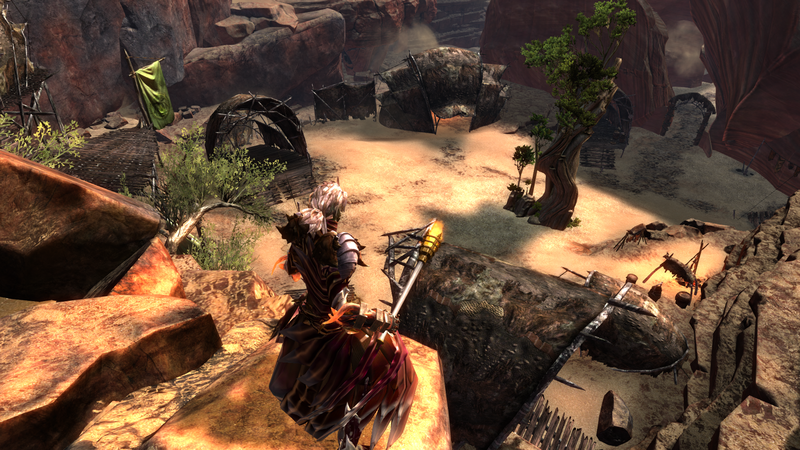 This eruption shattered the stone and tossed it across the land of Tyria. 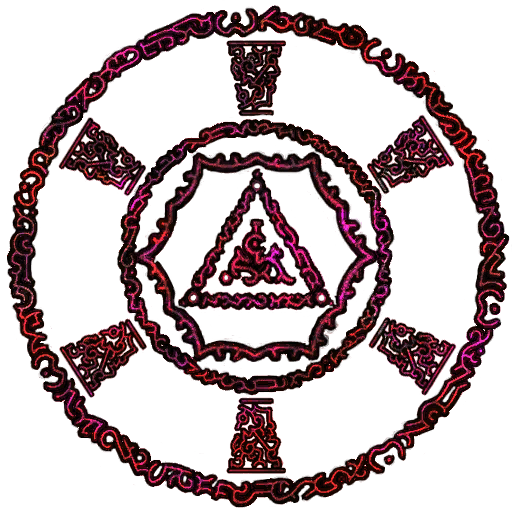 Now, it is of my personal speculation that Abbaddon was influenced by Zhaitan to do various things since Abbaddon had the gift of knowledge and past and future events and was also the god of water. But that's another chat for another time. The only use we have seen of the blood stones since this event, is that when life is sacrificed upon them, that the power is adsorbed from the vessel and transferred to another person or target. When the Lich was killed on the Blood Stone on the First Island, it sealed the Door of Komali, where the Titan Destroyers Lived. When chosen humans picked by the Eye of Janthir were taken to the Magumma Jungle's Blood Stone, they were sacrificed by the White Mantle, the White Mantle leaders absorbed their powers. And the Bloodstone Caves Bloodstone which was also use in White Mantle activity and where two major NPC were suppose to be sacrificed on. The other two pieces of the blood stone are still missing. Note 5 pieces of Bloodstone for the 5 gods at the time. As you can see from the map, we are not too far away from this stone. But I have noticed that this area seems a little browner then in the original game. then again the area was a wet land surrounded buy a canyon like area. So that could be why. Side note, the Mission for Bloodstone Fen was one of the hardest and most confusing to walk through in the GW game. And probably the most skipped Mission in the entire GW franchise. Again, the existence and use for the stone for GW2 is highly speculative by yours truly. But the power this possess can not be ignored. I think its use is very important to the later stages of this area. Lastly, every Dragon rise has been met with a Cataclysmic like event. Unless that event was the attack on LA, then we are not sure what event changed the land scape of the Magumma Region. Or where we awake from for that matter. For those of us that don't know yet, there was more map that was found outside of Dry Top by glitching out of the map. 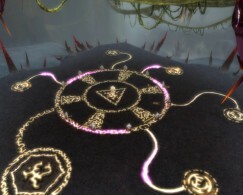 Some are saying maybe the Mysterious Figure is Ventari and this is his refuge although others argue that it is not coinciding with the GW1 map well enough. The figure's markings are closer to Tamini centaur markings, but they are unique. Even more proof that we are expanding -in- Dry Top region, so I do not believe that the zone we have now is the full Dry Top region at all. What do you guys think?